I am a researcher from the Faculty, I served as professor of Logistics and inventories supply chain, and international business. I like to write on the subject about retail and advise, I consult retail chains retail in Colombia and Latin America as.. Inclusion Policies for Students in Disability Status in the University Field, Richard Buitrago Reyes, 2018: Applied Dissertation of Nova Southeastern University, Abraham S. Fischler College of Education. Richard Orlando Buitrago Reyes added interests logistics in reverse, retailing, higher education and more. Richard Orlando Buitrago Reyes changed their profile image. 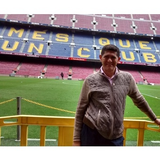 Richard Orlando Buitrago Reyes updated their profile information.